The Murders at Hanging Rock was first published in 1980. Below is the back-cover description from the 1988 reprint. This first ebook edition – with added material from The Secret of Hanging Rock – is published by Ansible Editions in 2016. What really happened at Hanging Rock on St Valentine's Day in 1900? Picnic at Hanging Rock is the source for this erudite literary entertainment, which will be enjoyed and appreciated by all scholars and lovers of unsolved mysteries. In The Murders at Hanging Rock, Yvonne Rousseau offers four logical, carefully worked-out but thoroughly tongue-in-cheek explanations of the fate of the missing picnickers from Appleyard College. Now reprinted with a foreword by John Taylor which casts yet more light on the subject, The Murders at Hanging Rock is an essential and amusing companion to Lady Lindsay's classic story. 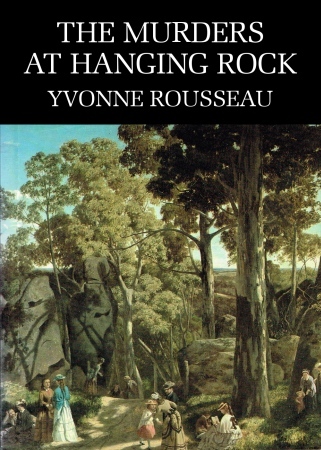 In 1987, the long-suppressed Chapter 18 of Joan Lindsay's Picnic at Hanging Rock was published as The Secret of Hanging Rock, a chapbook to which Yvonne Rousseau contributed a further ingenious commentary which has been added (with a new Preface of its own) to the Ansible Editions ebook of The Murders at Hanging Rock.